Sony is giving their exclusive live TV streaming service, PlayStation Vue, an expansion today. For those of you who don’t know, PlayStation Vue is a service Sony offers that allows people to stream live TV without the need for a cable subscription. The service comes packed with virtual DVR features, and choose your own Premium channel options as well. PlayStation Vue offers a very nice lineup of some of the most popular channels in the United States. One of my personal gripes with cable was the fact that I was paying for a ton of channels I would never watch. With PlayStation Vue, you get the best channels, starting at a low price of $30 a month. 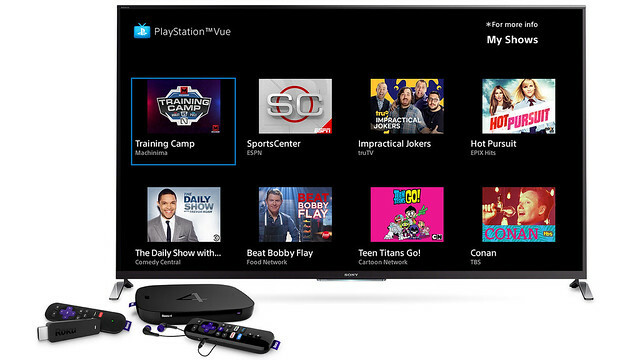 Starting today, PlayStation Vue will be coming to Roku devices, along with another planned expansion to all Android smartphones and tablets coming next week. PlayStation Vue will be available for all Roku Streaming Stick, Roku Streaming players, and Roku TV owners. Simply download the PlayStation Vue app, log in to your account and you can start streaming with ease right away. If you’re interested in PlayStation Vue, but don’t feel like spending money until you know what you’re getting, you can sign up for a 7-day free trial on the PlayStation Vue website, or on your Sony gaming console. In addition to the aforementioned devices, PlayStation Vue is also available for Amazon Fire TV, and Fire TV Stick, as well as iPhone and iPad through the PlayStation Vue mobile app. If you have a Google Chromecast device, you can access the service from any compatible iOS device in your possession. If you have family and friends you’d like to share a stream with, you can! PlayStation Vue offers members up to five simultaneous streams across multiple devices, with a maximum of 3 mobile streams. If you’d like to know more about the pricing and other additional details for PlayStation Vue, check out the plans Sony currently has available down below. For specific information on pricing and channel lineup in your city, including live local stations and regional sports programming, please visit psvue.com and type in your zip code. LookBroZombies_XBL, Zelkaar, Game_Breaker_ and 1 other person like this.